Agni-IV missile is equipped with state-of-the-art Avionics, 5th generation On Board Computer and distributed architecture. New Delhi: Nuclear strategic ballistic missile Agni-IV was successfully test fired from launchpad number 4 of the integrated test range at APJ Abdul Kalam Island off Odisha coast at 8.30 am on Sunday morning. This comes shortly after the indigenousy built Inter-Continental Ballistic Missile Agni-5 was test fired successfully from Abdul Kalam island. The missile includes indigenously developed ring laser gyro and composite rocket motor. The surface to surface Agni-IV missile having 4000 km strike range is a two stage missile. It is 20 meter long and weighs 17 tonnes. It was first test fired on 20 January 2014. 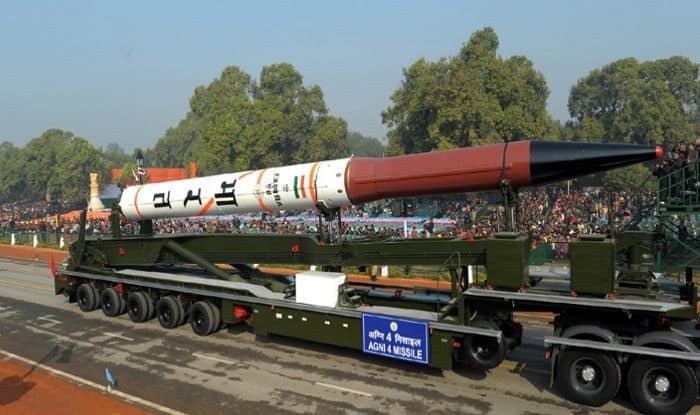 Agni-I, II and III and Prithvi missiles are already in the arsenal of the armed forces, giving them reach of over 3000 km, providing the country with an effective deterrence capability.